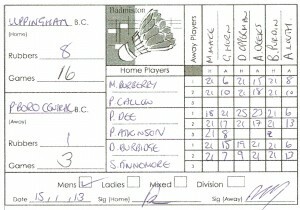 For their first match in 2013, the Men’s 6, took to the courts of Uppingham against Peterborough Central, the only team that they have not faced in this division so far. Home advantage was evident from the very beginning, with pairs 1 and 3 running through their opponents with relative ease. Pair 2, however, are notoriously slow starters, and decided to make things a little more interesting! At the change of ends after the first game, Peter and Pete, found themselves being watched by the other two pairs, whom had already finished! All was well, as they came in with a 25-23, 21-17 win. The rest of the evening was a fun natured affair, with the lads from Peterborough joining in the banter, making the evening another success and a great advert for our club. After the dust had settled, Uppingham came away with another good 8 – 1 win, to maintain their unbeaten status in this division. Well played to Mark and Paul, Peter and Pete, and Delwyn and Sherman and good luck next week against St Marys 2!